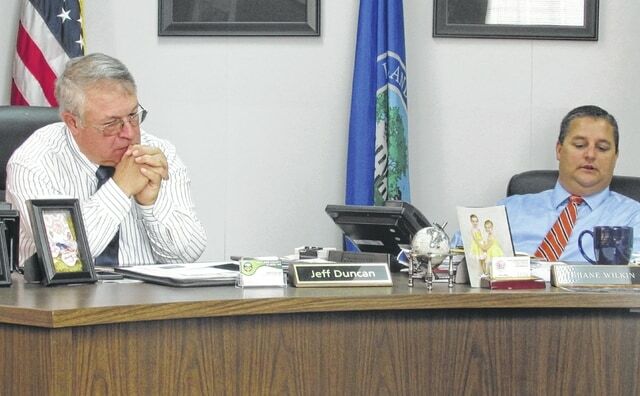 Highland County commissioners Jeff Duncan and Shane Wilkin are pictured during Wednesday’s session. He cited the recent preliminary agreement with Corvac Composites, an auto industry supplier, as an asset to the Greenfield community. The Times-Gazette previously reported that the agreement concerns the acquisition of the existing 175,000 square foot property that formerly housed the RR Donnelley facility. The expansion will bring around 200 new jobs to the area. Wilkin said on Wednesday that there are “a few things to finish up before that is finalized.” He added that Corvac Composites is currently in phase one of its evaluation of the property. According to Wilkin, the company and commissioners both did not foresee any possible problems. “It seems like it’s going to be a great relationship,” he said. Commissioners said that the hope is that Corvac will see the strong work ethic Highland County can offer to any new business. Commissioners thanked several individuals for their help with this project: Ohio Speaker of the House Cliff Rosenberger; Ohio Senator Bob Peterson; Katy Farber with the Appalachian Partnership for Economic Growth (APEG); and Highland County Board of Commissioners Deputy Clerk Nicole Oberrecht. Commissioners Jeff Duncan and Horst also thanked Wilkin for his work. Commissioners added that they are continuing to work toward the Leesburg Industrial Park becoming a “certified” site. The Times-Gazette previously reported that commissioners are working with South Carolina company InSite to reach that goal. In other business, Wilkin said he attended the yearly meeting for the South Central Ohio Agriculture and Community Development Fund (SOACDF). He said a total of $600,000 “could be gone after” in grant funds. However, no company or county will receive more than $200,000. Wilkin said there will be three competitive rounds for the region that includes Highland County. Also in that region are Adams, Brown, Clermont, Gallia, Jackson, Lawrence, Pike and Scioto counties. Wilkin said round one will be from July 1 through Sept. 30, round two will be from Oct. 1 through Dec. 31, and round three will be from Jan. 1 through March 31. Commissioners added that they will be looking for someone to represent the farming community on the SOACDF board. Duncan previously filled that position; however, as a commissioner he can no longer act in that role. For more information, contact Wilkin at 937-393-1911.